Home > PIC news > Tourism promotion event for Pacific Island Countries was jointly organized by TABIX(travel circle) and PIC. Tourism promotion event for Pacific Island Countries was jointly organized by TABIX(travel circle) and PIC. 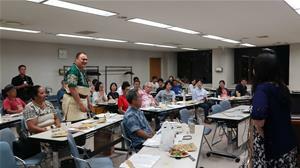 On 25th August, 2018, PIC organized promotional event for Pacific Island countries’ tourism jointly with TABIX (http://www.npotabix.com/) at Small and Medium-sized Enterprise Center in Meguro-ward, Tokyo. 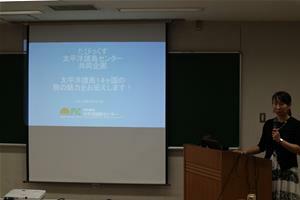 Ms. Takada, Promotion Coordinator of PIC, delivered presentation, covering all the 14 Pacific Island Countries by featuring each countries’ appealing traits and sights, to about 30 members of TABIX.. 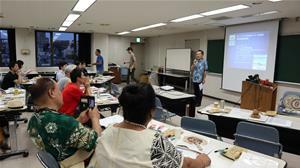 Participants from TABIX listened Ms. Takada’s presentation very attentively because Pacific Island Countries are largely uncharted area for most of them, although they are keen travelers who have travelled the world. 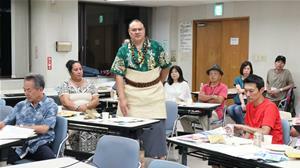 Mr. and Mrs. Palei from Tonga also talked about Tonga’s everyday life, let alone about its tourism. On top of that, some members who made trips around Tonga and Niue reported about the journey. All in all, this was informative and very successful event. Tasting was hold for such items like Noni juice made in Tonga and Samoa, Coffee of Papua New Guinea, Taro-chips and Chocolate of Samoa. All the participants received a gift of very popular Christmas Island’s salt of Kiribati. In this manner, this event was an excellent opportunity to increase recognition of products of the area. Last but not least, we would like to express our sincere gratitude for the participants, and for those taking charge of TABIX, who pulled everything together for this event.